Abstract: In the first column of this year, Kerry Hennigan continues her research to Michael Jackson’s fascination for the film noir genre. Hennigan, Kerry. 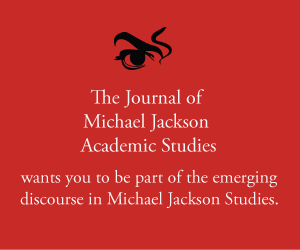 “MJ Studies Today XIII (14-01-2017).” The Journal of Michael Jackson Academic Studies 3, no. 3 (2017). http://michaeljacksonstudies.org/mj-studies-today-xiii/. “The Girl Is So Dangerous” – Michael Jackson and Film Noir – Part 2. Smooth Criminal hit the stage live during Michael Jackson’s Bad world tour, though not the earliest concerts. It was added to the set list for the 1988 leg of the tour. From then on, it became a Michael Jackson live tour staple, replicating the dance moves from the Moonwalker movie and transitioning to the 3D prelude for the song as we saw being filmed in the This Is It movie. This was an element Michael obviously loved – the film noir, the old black and white movies that starred Hollywood legends like Edward G. Robertson and Humphrey Bogart. And the femme fatale? Well, for This Is It, that had to be Rita Hayworth, stunning as Gilda, who strips off her long silk glove and throws it to none other than Michael Jackson! We also saw Michael’s interest in the film noir genre present in the short film of You Rock My World, only this time he had a comedian side-kick in Chris Tucker. Some modern Hollywood ‘heavies’ challenged him this time around, with none other than the original Godfather, Marlon Brando (one of Michael’s beloved father-figures) as the big bad boss. It is still fascinating (and fun) to watch as an art piece which was, for Michael Jackson, what short film-making was all about. Michael’s love of this genre is especially evidenced post-Smooth Criminal by the song and live performances of Dangerous. The influence of Fred Astaire and the classic musical ‘Band Wagon’ are so apparent here, and it is obvious Michael is paying tribute to one of his heroes while updating the tempo for 90s audiences. While not included in the 1992 leg of his Dangerous world tour, it was added to the set list for the 1993 concerts and became a concert staple thereafter (excluding the This Is It shows). Michael also performed Dangerous on one-off events like the American Music Awards 1993, MTV Music Awards and Wetten Dass 1995 and as late as 2002 for A Night At The Apollo. Dangerous, like Michael’s other songs in the genre, emphasises the tension between the sexes and the risk of ruination for the man caught in the net of the predatory femme fatale. Kenny Ortega explains, ‘Michael did like pushing the limits. Not only did he want to freshen up old ideas, but he came to the project with new ideas that were possible with new inventions in technology. In the wake of his passing, and in the many opportunities we’ve had since to learn and reflect on his art and his desire to always ‘push the envelope’, we can only wonder where Michael’s love of the film noir genre might have taken us next. Given his love for Cirque du Soleil shows, it’s interesting to look at what Cirque has made of Smooth Criminal in its global touring box office hit Michael Jackson the Immortal World Tour and the Las Vegas smash Michael Jackson ONE. It’s certainly possible to imagine that Michael would have shared her excitement.